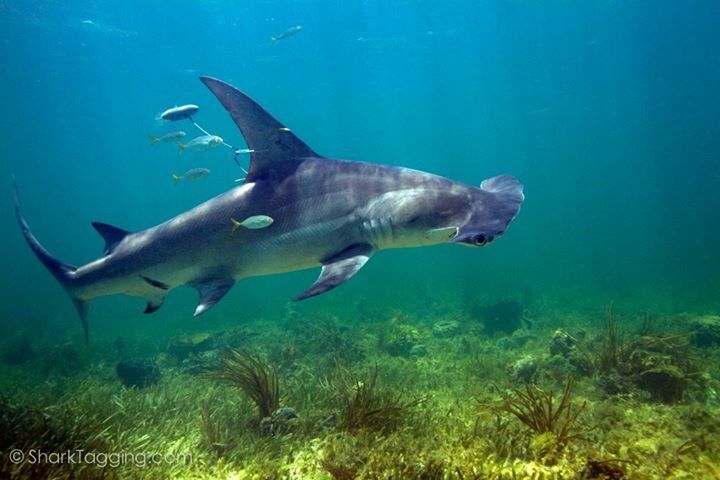 It’s illegal for anglers to land hammerheads in Florida. It’s time that media coverage pointed that out. In other words, if a fish is brought out of the water, it is “landed”. If anglers stop the act of releasing a fish to measure it or take a photo, it is not “immediately released.” If a fish isn’t “immediately returned alive and unharmed” (and if the extremely physiologically stressful act of bringing a hammerhead out of the water results in it dying after release, it was not released “unharmed,”) it is harvested. If you drag the shark out of the water and leave it there until it stops moving long enough that you feel safe to approach it, that is not an “immediately released” animal, and it isn’t an animal that is “released unharmed.” Landing and/or harvesting hammerhead sharks is illegal. This is clear under the law, and has been confirmed by numerous consultations with an FWC Law Enforcement official. Scientists have observed rapid and severe population declines among great and smooth hammerheads, both of which are listed as Endangered by the IUCN Red list and both of which have been proposed for United States Endangered Species Act protections. Additionally, recent research by our lab (paper here, explanatory video here) has shown that these animals have among the most severe physiological stress reactions to fisheries capture. They frequently die (sometimes after swimming away) as a result of capture stress, making them poor candidates for catch-and-release fishing. So to sum up, it’s illegal to land hammerhead sharks in Florida, these animals are Endangered, and capture stress can often result in killing them. So why has there been so much media coverage of anglers bringing hammerheads ashore in Florida, and why has none of it mentioned that this activity is illegal or harmful to an Endangered and protected species? In February, a large hammerhead shark won a local shark fishing tournament. He brought the shark out of the water and stopped the release process to measure the shark and pose for a photo. According to the Florida Fish and Wildlife saltwater fishing best practices guide, “it is never legal to hold on to or tow a fish that is not allowed to be harvested to a place to weigh or measure it.” Media coverage did not mention this. In March, local University students caught a 700 pound hammerhead shark, brought it ashore, and posed for pictures and measurements.” These students clearly broke the law, and the best available scientific data suggests that a fight time this long results in killing an Endangered and protected species. Media coverage did not mention that the sharks are Endangered, that is is illegal to bring them ashore, or that the animal likely died from capture stress. This week, another angler caught a hammerhead and brought it ashore, again stopping to measure and pose for photos. The media coverage referenced that it was a “thrill” to catch such a big fish, but not that it was illegal and almost certainly killed an Endangered and protected species. The 13 news articles that make up the first page of Google News search results for “Florida Hammerhead” are a mix of local, national, and even international news outlets. They include words like “monster,” “adrenaline,” “cool”, “achievement,” “ultimate catch,” massive,” “giant,” “exciting,” “extreme,” “frightening,” “harrowing,” and “epic battle.” Not one article mentioned that great and scalloped hammerheads are IUCN Red List Endangered. Not one article mentioned that these animals are protected in Florida waters, or that landing these sharks is illegal in Florida. Not one article mentioned that the stress resulting from such an extended fight time has been shown to result in post-release mortality in this species. Several articles mentioned that the anglers release the sharks or use circle hooks, which is a step in the right direction, but not terribly helpful if the other fishing practices kill the shark anyway. Legal protections for hammerhead sharks are a critical part of their conservation, but they are useless if they aren’t enforced. Instead of covering these stories in the context of “here’s a harmful and illegal activity that is likely killing Endangered and protected species,” many journalists are covering them as “here’s an exciting thing someone did.” Many of the stories end with the angler announcing plans to catch an even bigger shark next, which could easily result in copycat behavior as readers try to duplicate the exciting activity they read about. It is completely unacceptable that people are bragging about their illegal activities on the news without a single mention that they are illegal or harmful. This kind of media coverage glorifies what it should condemn. Frequently asked questions (and their answers). How much shark fin soup could you make from an adult megalodon? You should be more concerned with the fact it is legal to catch and keep endangered species in federal waters, but you seem to care more about a few infrequent shark landings where the fishermen try their best to save the fish. So you’re saying I should ignore illegal behavior that harms an Endangered species because other bad things are also happening in other places? No, no I’m not going to do that. Have you contacted the reporters directly? There’s likely some negligence, but mostly ignorance here. Reporters do love crime stories, after all. If they’ve been informed and refuse to include that, it’s a big problem. Otherwise they could be allies. Some of them. There are entirely too many of these kinds of articles for me to keep up, with more coming every week. Whenever I hear a story like this, I immediately contact the news organization. This is ridiculous. Hi David, I’m really glad you posted this, and I agree wholeheartedly. I have a somewhat related comment and question – the photo you use as an avatar on this site – is that a protected species? (my guess is a bonnethead, and I’m not a shark regulatory specialist so I’m not sure of their status.) the point I’m trying to make is that I wonder if it does damage to scientists to display photos of themselves posing with protected species when we are then saying ‘please don’t do this’ to the general public. I know, I know, it was captured under completely different circumstances than those you are speaking of in this post, and your photo is not subjected to the horrors of media ‘sensationalization’ and mass distribution. Also, I know that sturgeon permits I work under prohibit use of photos taken while working under them, or at the very least the permit number must accompany each use of the photo. Not trying to ‘flame’ or anything, just seeking a dialogue about whether there is any ‘good’ way to post ‘posed’ photos with protected species. I assert my right to disagree with all this shark protection…except I agree with banning “finning” for soup. Why isn’t it illegal for sharks to attack humans? All these guys who worry about these killers, ought to talk to the people who lose limbs or die from shark attacks, they wouldn’t feel so touchy-feely about sharks then. (I know those attacks aren’t usually hammerheads…but these shore or pier caught ones are awfully close to our kids swimming.). I’m more worried about the lionfish eating all the fish on the reefs, all there will be is an underwater desert with lots of lionfish. Why isn’t illegal for animals to do things? I honestly can’t tell if you’re kidding. Also, “I disagree with this law” does NOT mean “I don’t have to follow this law.” You understand this, right? Mark the Shark is very careful not to violate any laws. How does he avoid breaking laws – doesn’t he “land great, smooth, or scalloped hammerhead sharks in Florida waters.” ? Personally I will avoid any Marriott hotel from now on. He purports to assist researchers -wonder what University of Miami RSMAS scientists think of this Mark the Loser? He catches hammerheads in Federal waters. It’s not illegal to land those. As for what we think of him? Of all the interesting characters I’ve come into contact with doing shark conservation advocacy, Mark is definitely one of them. You neglected to mention where those sharks in the news stories were caught. Were they in state or federal waters? My goodness there is a baffling amount of stupidity and ridiculous comments on this feed! Thank goodness that David is a patient and an intellengent guy! This situation is unacceptable and should not be tolerated! These anglers broke the law and should be punished or fined accordingly…period! People should educate themselves on the importance of our apex predators, specifically sharks, and their role in our oceans. Hey Dave, I just found your blog through the Yahoo article on that goblin shark. As someone who really cares about sharks and their survival I just want to thank you for being patient and informing the public on very important information. Also while looking over the comments I noticed the “Mark the Shark” guy, it really ticks me off when people post articles (Like these http://www.marktheshark.com/stories.html) describing sharks as “Murders” and “Man-Eaters”, only talking about the attacks. What are your thoughts about media describing sharks as killers? Is it contributing to the mass killing and slaughtering of sharks?